Open-cell foam is essentially a bunch of little bubbles or balls that are broken and air fills the spaces in the material. Air and moisture can move through these open cells. The R-Value of Open Cell foam is typically between 3 and 4 per inch. This foam is typically low density and soft like a cushion or sponge. Closed-cell foam is essentially a bunch of little bubbles or balls that are not broken. The cells are filled with a special gas of higher insulating value then air. The closed cells greatly reduce the ability of air and water to move through the foam. The R-Value of closed-cell foam is generally from 5.5 to 7. 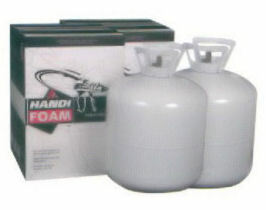 Closed-cell foam typically dries strong and rigid. What is the "R" value of your foam kits? The aged R-Value of Quick Cure and E-84 foam is 6.2 per inch thickness. The aged R-Value of the Slow-Rise formula is 5.9 per inch. The initial R-Value can be R-7 or more which is what many other vendors specify on the exact same product. Why do some of your competitors claim higher R-Values for the same product? The actual R-Value of sprayed foam varies depending on a number of factors including temperature, humidity, application method and final density to name a few. For example our Quick Cure product can have a cured R-Value of between R-6.2 and 7.4. We choose to error on the conservative side and use R-6.2 per inch. What is the coldest temperature at which I can spray foam? It is extremely important to keep the core temperature of the chemicals inside the tank between 75 and 85 °F for Closed Cell and 85 and 95 °F for Open Cell. However, you can spray it at much lower outdoor temperatures provided that you warm and maintain the tanks in that range. Several ways to achieve this include: placing the tanks inside a warm bucket of water, or using small space heaters. With the proper set up, you can spray foam with outdoor ambient temperatures below freezing. If the surface on which you are spraying is very cold, it is recommended to coat it with a thin coat of foam first. The chemical reaction of the foam will work to help warm that surface. I am building a new house and interested in using spray foam insulation. How much do I need? The first thing to realize is that foam insulation while being the best insulation is also generally the most expensive insulation. Higher density closed cell foam is going to cost around $1 per board foot (12" x 12" x 1"). Low density, open cell foam is going to cost around $0.55 per board foot. If you can afford it, filling the whole cavity with closed cell foam will result in the best overall insulated wall. As that gets expensive pretty fast, one common solutions is to apply 0.5" to 2" (depending on your climate) of higher density closed cell foam and then fill the remainder of the cavity with lower cost open cell foam, fiberglass batts, or blown cellulose. This will give you a good air seal which is after all one of the biggest benefits of the foam insulation. The best way to determine how much you need is to approximate the total area in sq ft and multiply that by the thickness in inches you intend to apply. The result is the number of board feet required. What safety equipment is required for handling and spraying foam? Your personal safety is a great concern of ours. We recommend wearing the following Personal Protective Equipment(PPE): Dual Cartridge Respirator (NIOSH approved), Safety Goggles, Nitrile Gloves, and clothing to cover your arms. 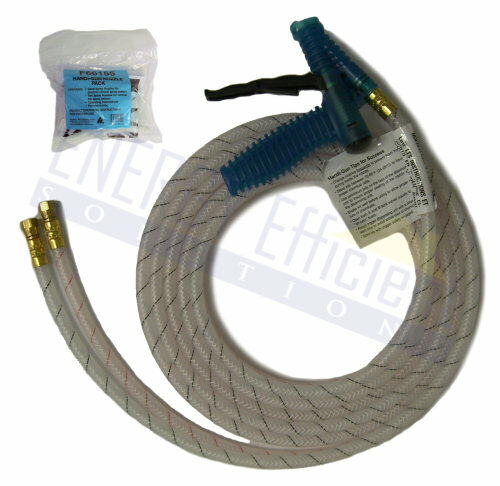 In addition we sell a full Spray Foam Insulation Safety Kit if you need to purchase your PPE. In addition there is a PPE guide included with each kit. Please take the time to review it prior to beginning your project. How do I know which type of foam and how much I need for my particular application? This is a great question. Asking is the question is the first step in making sure you use the correct product for your application. There are so many different types of applications and climates that we can't answer this question here. We do offer several online tools to help guide you in determining which product to use and how much to apply. If you need any further help, please give us a call toll free at 877.464.5828 between 8:30 and 6:00pm, M-F.
How smooth will the foam be once it has cured? The look, consistency, thickness and density depends mostly on application technique. It is virtually impossible to get a completely smooth surface when spraying by hand. It is typically best to apply it with a slow smooth motion. Take a look at our pictures or watch our spray foam videos to get a good feel for what to expect. What all is included in your foam kits? Each kit includes everything you need to start foaming: two steel cylinders (component A and B), a hose and gun assembly, a starter pack of nozzles (3 fan and 5 cone), petroleum jelly for the gun tip and instruction. Do you offer discounts on larger quantity foam orders? Yes, if you need to purchase more than several kits, please call (972) 499-4550 and ask about a quantity discount. Why are the UPS shipping cost so high and what other services do you offer? There are several factors that make UPS shipping cost high. First, the packages are heavy; one 605 kit weighs roughly 115 lbs. Second, due to the nature of the chemicals and blowing agents, the kits are considered HAZMAT. UPS HAZMAT fees are currently $27.50 per package (The 605 kits ship as two packages). We also offer LTL freight service which usually cost less than UPS when you order two or more kits. If you live near Dallas, TX you can also pick up your order.